Vancouver, British Columbia / July 30, 2018 / Arctic Star Exploration Corp (TSX.V: ADD / FSE: 82A1 / OTCQB: ASDZF) (“Arctic Star” or the “Company”) is pleased to report the outcome of its 2018 spring exploration program on its Diagras Property (“Diagras” or the “Property”) located in the Northwest Territories, Canada. 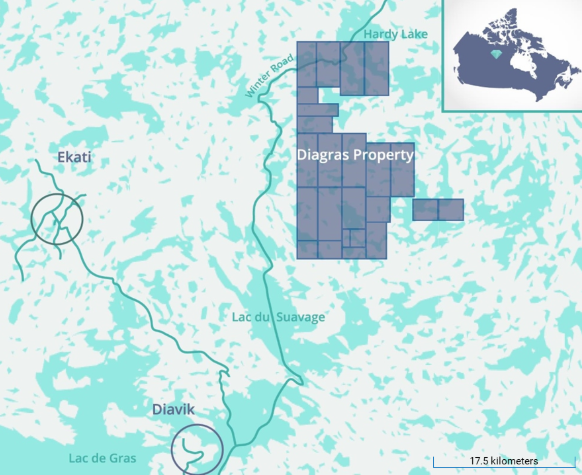 Diagras is a contributing Joint Venture (the “Joint Venture”) between Arctic Star, which holds a 40% interest, and Margaret Lake Diamonds Inc. (TSX.V: DIA) which holds a 60% interest, and acts as project operator. At the DG007 anomaly, previous explorers targeted a “classic” Lac de Gras, magnetic and EM anomaly. Two holes were drilled but failed to explain this anomaly, intersecting only granite. One of the drill collars has been found in the field and its position is displaced from that reported in assessment files, possibly due to GPS errors. Drilling to properly explain this target, which the Company believes is likely to be kimberlite, is required.